Apple may be winning the smartphone market and still lead consumer tablet sales, but report after report says that they're losing out on school sales. And according to Futuresource, that trend continued in the 4th quarter of 2014. This consulting firm released a new report yesterday which said that that Chromebooks completely overtook the iPad last quarter. 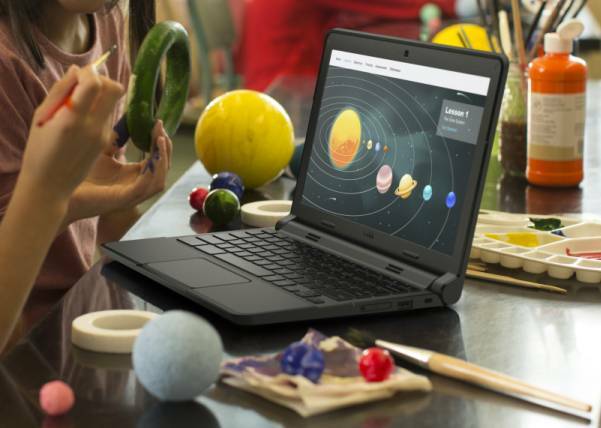 Their estimates put the Chromebook at a combined 39% market share, passing the iPads (26%) as the bestselling device type on the market. Futuresource believes that over 3 million of the cheap notebooks were sold to US schools in 2014. If accurate, this would likely mean that the number of Chromebooks in use i schools are probably outnumbered by iPads, but that will likely change over the next year if this trend continues. Apple has faced several setbacks in the educational market over the past year, including most notably the embarrassing debacle which was the LA school district's billion dollar iPad program. That program was supposed to distribute 600,000 plus iPads, giving one to every student, but was beset by technical (the students readily bypassed the security), logistical (iPads were distributed and then vanished), financial (the program was funded by construction funds - illegally), criminal (the FBI started an investigation in December 2014), and ethical (the deputy LAUSD Superintendent was a former Pearson exec), and finally, personnel issues (the LAUSD Superintendent resigned last fall over this boondoggle). All in all, that one project managed to cover just about all of the wrong buttons. Just about the only ones they missed involved dead hookers and/or illegal drugs. How is Apple “winning the smartphone market”? They are the second smartphone maker by volume and last year they had 14.8% share according to iDC. If you exclude the US ,UK and Japan their share drops very hard. They lost it long ago and the worst for them is yet to come. In a few years prices will settle at 50% of Apple pricing, like in PCs and maybe some markets get rid of carrier price fixing monopolies – without carrier subs Apple’s share would drop at least 5% today. If they are winning the smartphone market then according to your numbers they totally obliterated Chromebooks in schools since their volumes must have a hidden multiplier or something. Apple is making 89% of the profit. I would call that a win. Apple completely wins the high end smartphone market by a huge margin. They have well over 50% share of phones priced over $300 (without a contract) and beyond 80% of phones over $500. And the lion’s share of profits. The US, Japan and UK are great phone markets to be in. Why would you exclude them, other than to try to fix the statistics to show Apple isn’t doing well? All these predictions that Apple will fail years from now… fail. In particular, Apple was supposed to have lost the PC market long ago, but it’s PC market share continues to grow. (And it’s profits are large in that market also.) The myth that market share determines a tech companies fate has been completely disproven. The Wintel formula was great for Microsoft (until it started to decline) but always bad for the actual manufacturers, which have to race to the bottom. The failure of that formula is repeating itself as Samsung’s profits fall since tying itself to an open operating system that forces prices down and profits to disappear the minute a new competitor enters the market like Xiaomi. New competitors will always be able to come in lean and mean, adopt the best features of an open system, and undercut established players. It’s a Death Race for anyone entering the business that depends on an open system. This Chromebook doing well in education meme is also likely to turn out to be a statistical market share blip. But, hey, have fun running with it, Nate, until it is completely disproven a year or two from now. Like all the other Apple is doomed predictions. You are assuming institutional sales markets behave exactly like consumer markets. Historically, they haven’t. In institutional markets the buying decision isn’t made by the end user but by management and techies. Both prefer commodities whenever possible and both prefer products that let *them* control user behavior. Historically, Apple’s strengths have run counter to those preferences and when they have been strong in education it has been driven by the “grassroots” and when they have faded they have been displaced by players targeting management. The Chromebook vs iPad matchup plays into that scenario: the early bulk sales were driven by the iPad’s consumer popularity, especially with the media and politicians but once the institutional powers got involved their concerns and interests are gaining weight. And those interests are focused on the system, not the users; the network more than the terminals. Chromebook is a classic IT product catering to the establishment powers, reducing their client side costs and workload so, of course, they love it. The Chromebook vs iPad debate is essentially a replay of the NC vs PC catfight of the 90’s. That was won by MS precisely because their hardware partners were willing and able to race to the bottom and undercut the NC hardware message and MS was able to answer the client configuration and management issues before the SUN/ORACLE message got traction. So far, Apple has not addressed either side of the Chromebook value proposition. As long as Chromebooks are cheaper than iPads and deployment means “take out of box and plug it in” the IT types will keep on pushing them. And they’ll keep on selling because the IT types are the ones making the decisions. Doesn’t mean Chromebook is guaranteed a win, long term, but until Apple counters Google’s message the iPad isn’t going to win the IT hearts and minds.